Snow and poor weather conditions have caused the postponement of football fixtures across the country. Football League matches at Tranmere and Bradford and six games in Scotland have been called off so far. 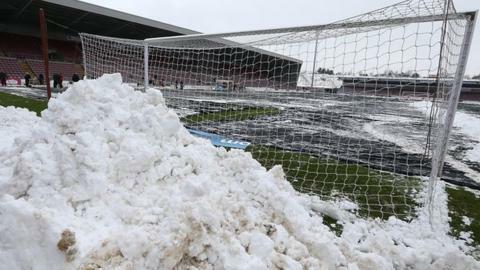 Macclesfield Town's FA Cup tie with Wigan Athletic is set to go ahead after the club asked for volunteers to clear the snow at the Moss Rose ground. All of the 12 FA Cup fourth round fixtures scheduled for Saturday go ahead as planned. Dundee United's Scottish Premier League meeting with Ross County will go ahead after the Tannadice pitch passed a Saturday morning pitch inspection. The Met Office forecast for Saturday is for the snow to gradually clear eastwards, with some sunshine later.